We've covered Edinburgh emcee Werd many times on SSU over the years. Each of his records have sounded distinct in their own unique way. 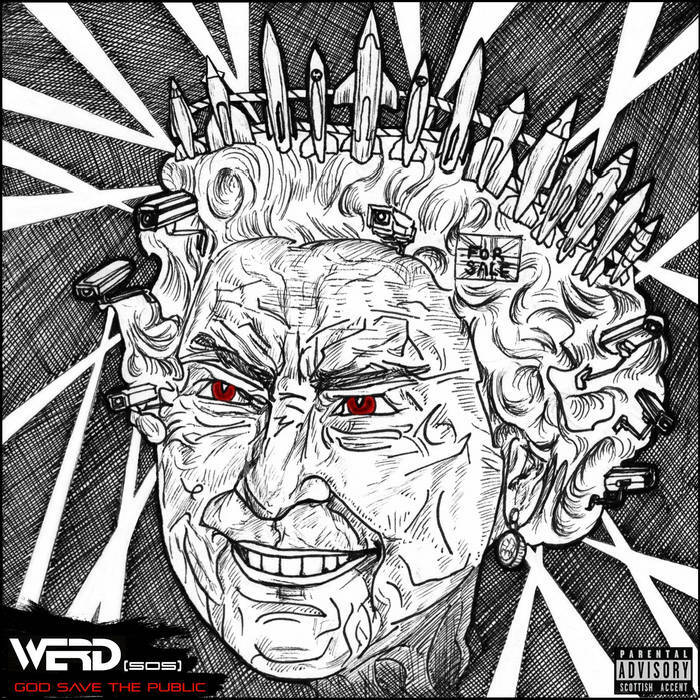 However, our reviewer Stephen Butchard isn't overly enamoured with Werd's latest record 'God Save the Public'. A disclaimer: this review is going to feature a lot of comparisons to US emcees. I’m sorry - comparisons can be really lazy in music reviews. Anyone can say that an indie band sounds a bit like the Strokes, or that a beat sounds ‘Pharrell-influenced’. In the case of Scottish rap, contrasts to the genre’s lineage are all too easy. With a movement that’s still relatively untapped by major music writing, it’s tempting to compare a Scottish MC to their American or English equivalents as shorthand. But Scottish rap deserves better. It’s a scene that’s matured to the point that calling it ‘grime up north’ isn’t going to cut it. These varied voices have enough to say on their own, and deserve to be looked at on their own merits. Half-hearted rapper comparisons don’t work. Most of the time. Werd’s ‘God Save the Public’ is not one of those times. Werd has been rapping, battling and creating for over a decade, without ever losing his energy, momentum or ambition. From his early mixtapes all the way through to this, his third full-length, he’s been an artist at the very heart of the Scottish rap scene, using his music as a love-letter to those around him. Werd can string a narrative together, but unfortunately, the listener never gets a sense of who he is. Instead, the album can feel like an amalgamation of rap tropes done better elsewhere. The tortured artist narrative has been a hip-hop staple for years, but this album feels like a whinier Hopsin-variant than it does a disturbing Danny Brown take (there’s the comparisons I was talking about!). The album’s main flaw is that it spends so much time looking for an identity in its influences that it comes out without knowing what it is. Werd strains his voice with awkward ‘yo’ ad-libs at the start of BASE God and God Save the Public, forcing Americanisms that grate in his Leith accent. His wordplay is frequently forceful, but when wrapped in such unsure delivery, it misses its impact more than a few times. The beats from Darko Strauss are just as hit-or-miss. The dramatic guitar/piano whirlpool of Personal Nonsense matches Werd’s downtrodden verses well, and the barebones drums on Nightmare soak up all the grit of Wardie Burns’s barked guest spot. The sour synths on I Am (Watching Adverts) are as desolate and depressive as Werd’s bars, while what sounds like a Killer Mike beat blares out of another room. Some other moments sound cheap rather than grimy. The stabbing pianos on Extremist sound a bit like a Nickelodeon Halloween special, with many key sounds dull and buried in the mix. The debt to American underground rap is apparent throughout. On Rather A Log Cabin, Werd manages to butcher Nina Simone with a weak sung chorus (an unfortunate constant throughout the album) while also evoking Flatbush Zombies with an overly familiar verse structure. Time and time again, it’s Werd’s staged delivery that dampens the record. If you can stomach the overdone rap tropes, you might enjoy this album more than I did. But for now, there’s a feeling that Werd needs to find his own identity if he’s going to write more compelling hip-hop.